Yoga, for me these days, is less about DO-ing and more about BE-ing. When I teach or when I am practicing, I am more interested in holding space for what is coming up. Holding space for exploration of emotion, idea, and feeling; rather than analyzing, predicting, and assessing. As our personal practices evolve, we might find ourselves migrating. In this migration, we might find there is more space for silence and just observing. When I began my yoga journey, I primarily focused on alignment, execution, and a cerebral understanding of what this practice of yoga is all about. Nowadays, my practice is more of a full-on sensory experience. I am no longer as concerned with mastering that headstand or the precision of the pose. It is more about the essence of my entire life. Am I living in accordance with my own personal ethics? How am I putting the yamas and niyamas into practice every day? What emotional, mental, physical, and energetic impulses/reactions/sensations occur as I move through my life – both on and off the mat? This is holding space for possibility. Holding space so we have this room to explore and just be, with no expectation or judgement. From this place, everything becomes possible because we are no longer boxing ourselves into a preconceived notion of how-this-should-be-done. I recently returned from Bali where I was assisting and teaching with Cat Kabira during her 200-hour foundation yoga teacher training. During those five weeks, I explored the edges of holding space. Of knowing that when space is created, we – all of us – have the opportunity to step into our own personal power. In fact, it is when we DO LESS, that we ALLOW FOR MORE. I witnessed people stepping into their personal power on a daily basis, trying it on and seeing just how good it feels to set boundaries and not apologize for who they are. I witnessed transformations in people’s personalities and practices, both on and off the mat. I witnessed myself stepping into the space of doing less and, as a result, enjoying the process of life even more. Having the time and energy to hold space is an incredible privilege. I am aware of how precious this place of “doing less” is. These brief moments of being, not doing, are an incredible gift and one – when we are fortunate enough to have them – should not be taken lightly. How can we all DO LESS in order to BE MORE? How can we hold space for others to just be – without reservation – fully and completely who they are? The next time you are on your mat, I encourage to let go of any ideas of what “should be.” Explore your practice from a place of spaciousness and freedom. A place where everything is possible, and nothing is off the table. I’m lucky enough to hold space next with Cat Kabira in Bali again for her September/October 200-hour yoga teacher training at The Yoga Barn! Join us there! Happy 2015! Oftentimes, when the calendar ticks over from December 31 to January 1, we take time to reflect and then determine how we want to move forward. For some, that means making resolutions. For others, that means they keep on keeping on…approaching things in the exact same way they have done before. I did a lot of reflection as we moved from 2014 to 2015 and I realized that I want to spend this year living with intention. What exactly does “intention” mean to me? It means that I think, speak, and act with clarity and purpose and that I have nothing but the best outcomes in mind when it comes to the activities, relationships, and work I do. I know that things might not always work out the way I want them to, but if I moved into the space with the best of intention, then I know that I have done my part. That got me thinking…how can I best live with intention? Even more so, how I best live with good intention? Immediately, the five Yamas came to mind. The first of Pantanjali’s Eight Limbs of Yoga, the Yamas are five guiding principles for how we engage with both ourselves and our outer world – on and off the mat. Ahimsa or Non-Violence. Do no harm, either to yourself or to other living things. The foundational Yama, this practice encourages to be kind, to ourselves, other people, and the earth. By being non-violent with our thoughts, words, and actions, we manifest care and love in everything we do. How can I live with more love in my life, especially toward those things, situations, and people that challenge me? Satya or Truth. All of the Yamas build on one another, but for me personally, Satya and Ahimsa go hand-in-hand. Can we be truthful in our intentions? Can we recognize when we move into spaces in a connected and loving way versus ways that make us react with negative emotion. Can we be honest with ourselves about how we relate to ourselves, others, and situations? Can I be compassionately honest when talking about my feelings and where I am in relation to my life? Asteya or Non-Stealing. All you need is within you! In this day in age, it can be very hard to tell the difference between being inspired and then doing something and then outright copying what someone else has done. I was watching a show the other day where a group of chefs were talking about this very thing. They noted that inspiration is all around us and if you do find yourself taking inspiration from another, be sure to credit that individual. They also noted that they enjoyed each other’s cooking so much more when they could tell it was an “original.” In other words, be an original. Don’t take from anything or anyone else. We are all rockstars…just as we are! Aparigraha or Not Having Greed or Possessiveness. In these Pinterest-fueled days, it can be challenging to not covet or want something else…and something else on top of that…and a little more of that on the side. I explored this Yama during my teacher training and realized that, for me, it came down to the question of “Is this a need or a want?” I ask myself that all the time – food, clothes, things for the home. Is it something I am craving or is it something nourishing? 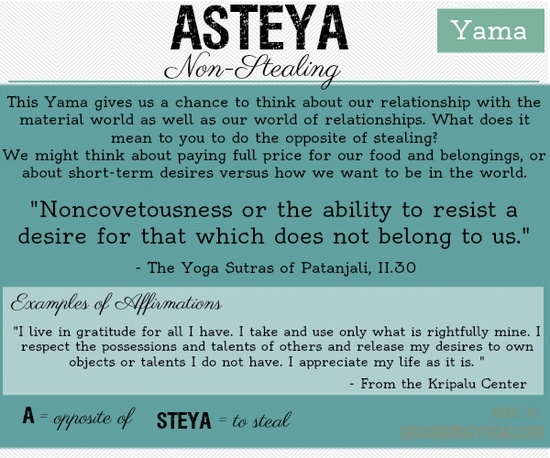 In the end, I realize this Yama brings me back to Asteya – I have all I really need! Brahmacharya or Moderation. In the end, it all comes down to knowing when enough is enough. Have I encountered today with enough of all the things I need (not want!) to live a full, nourished, loving, and engaged life. This Yama encourages us to monitor ourselves and when we do find places of excess in our lives. Why does that excess exist and is it possible to mitigate that excess in some way? How are you planning on going into the New Year and where are you finding your inspiration for your every day life? Happy 2015! May this year be full of love, joy, and peace! It is truly a beautiful thing that we have the ability in our lives to bring love, joy and comfort to others. I was just reading an article on Elephant Journal by Susan McFadzean who chose not to complain for thirty-two days. In doing so, she discovered some things about herself. You can read her full post here. What struck me, however, is that when we complain, not only do we do harm to ourselves, we also harm others. Remember “Ahimsa?” The concept and practice of not doing harm to others or to oneself? Well, I know that when I complain, it is usually about something I feel I haven’t done well at (last night’s dinner), something someone has done or is doing (maybe they are just doing the best they can with what they have at the moment), or a situation that I have the power to change! By complaining, we are causing harm to ourselves and others by thinking negative thoughts and sharing those negative emotional and thought patterns with others. So, why complain? Why not have the “thoughts, words and actions” of my life reflect anything but love, joy and comfort? I know we like to give a pass sometimes…and I believe there is a big difference between venting every now and then and complaining on a regular basis. If we don’t let our frustrations, sadness and hurt out every now and then, it can become toxic and have other negative outcomes. That is every once and a while. If we find ourselves complaining about every little thing, what can we do to change our situation? How can we change our perspective or perhaps invite more love and light into our lives to counter those things that make us angry or annoyed? I want to happy and free. Eliminating complaints is part of that process of becoming just that. I like Susan’s approach. I’m considering a thirty-two day challenge myself! Anyone else with me? Kshama. Being in the present. The here and now. Not focusing on yesterday, five minutes ago, five seconds from now or this evening. Kshama refers to the practice of patience. Of relishing in the current moment and of being completely absorbed in the current state. I think this comes most easily when we are in the act of doing something…especially something difficult and challenging. Think about those moments on your mat when you are working your way into half moon pose and you are completely entranced by the way your body is lifting, extending, twisting and balancing. As you move into this difficult pose, most likely we aren’t thinking about what is on our to-do list for later that day…erm, at least I’m not! Kshama can also be applied when in the presence of others. I often practice this when speaking with my husband. In order to show him that I am fully present and engaged, I can’t look at my phone, glance at the computer, cook dinner and take out the composting all at the same time. Instead, I need to look into his eyes, open my ears and heart and truly take in his words, tone, inflection, body language so I can fully appreciate what he is communicating. I personally believe that Kshama becomes more challenging the more things we place in front of ourselves. There are deadlines and texts beeping. Schedules to keep to and more things to sign up for. There are obligations and emails to respond to. It is my hope that with our continued intentional attention to Kshama that we can pause, take notice of the sky, the clouds the sounds and sights around us. That we truly smell the scent of spring promisingly situated upon the breeze. That we notice the ice and snow melting creating mini-rivers for us to splash in. That, in this time of transition from one season to the next, that we transition with it…not oblivious to it. In continuing my study of the Yamas, Brahmacharya has to be one of the most intense and confusing with many people having many different opinions over what it truly means. I turned to Yoga International for some guidance and found this video on their site. Click the image below! For me, when I think about what may be out of balance in my life and what has been out of balance for a very long time was my relationship with food. I suffered from eating disorders (anorexia, bulimia, over-eating) for over 20 years. While food continues to be a struggle for me, exploring that relationship through Brahmacharya has helped me see it in a new light. I’ve taken steps in the past, but by viewing my relationship with food through the Yamas (all of them apply here! ), it is helping to do some deeper work and to further develop a healthier and more beneficial existence with the nourishment my body needs to do the things I love to do and to be the best version of myself I can be on a daily basis. What is out of balance in your life? I am terrified of going upside down. It is a fear I’ve harboured since I was a child. When I look on Pinterest, or at Yoga Journal or any number of sites that celebrate yoga poses, the inversion is king. Do a handstand and you’ve “made it” in the yoga world. Or, at least, that’s the message I am receiving when I look at the glossy mags on the stand in the bookstores. In all honesty, I am cynical and angry because I don’t feel as though handstands or other arm balances are accessible to me. I look to my neighbours on the mat moving into crow or balancing on their heads and I am jealous….I want that. It is something I covet. While I celebrate their hand-balancing successes (and I truly am excited for anyone who has the ability to invert themselves) there is also a sense of loss and frustration that comes with it for me personally. Now, I’m not talking about stealing in the sense of an object or coveting another person’s belongings, but I am coveting that persons abilities and skills. Rather than celebrate and continue to practice, I sometimes just look on longingly at my fellow yogis wishing I had what I seemingly don’t. At the same time, this brings back the first Yama – Ahisma (do no harm). I am not willing to go full throttle into a inverted situation that I am not feeling comfortable with. I believe I would do more harm than good to my mental, emotional and physical state. So, I will continue to practice. I will continue to celebrate fellow yogis who take flight! Are you afraid of headstands/handstands/arm-balancing? Were you ever and overcame it? Tell me about it!